Even as Education Minister Anthony Garcia has made additional demands on them to oversee security, principals have made their own demands for more resources to carry out this mandate. Last week, Garcia issued new guidelines on security for primary and secondary school principals, making them responsible for the surveillance of entry and exit points and screening of all visitors with the assistance of security guards. However, principals of Presbyterian schools are concerned about the measures and have referred the matter to the TT Unified Teachers Association (TTUTA) and the National Principals Association for guidance. Garcia’s security protocol followed the armed robbery of teacher Angel Narine at Jordan Hill Presbyterian School, Princes Town two weeks ago. The Presbyterian School Board held a meeting on security last Thursday at Susamachar Presbyterian Church, San Fernando where 70 out of the 72 schools were represented. Jordan Hill principal Magdalene Ali was present. The principals opined that the ministry is demanding more of them but as their employer it was not providing them with the resources. “You want improved security, but you are not providing the schools with the resources. Principals have to go out there, into a society where the resources are also limited, cap-in-hand, to secure funds,” one principal told the meeting. The armed robbery of the Jordan Hill teacher also raised the question of how do schools protect themselves from gun violence. Even the fatal shooting of 17 students and teachers at a Florida high school recently highlights a risk schools may now have to prepare for in their security protocols. These concerns were shared with Sunday Newsday by a member of the school board who attended the meeting. “With reference to the robbery at Jordan Hill, right now we are looking at a bandit who entered the primary school and robbed a teacher, but what about if we have a situation like in Florida with somebody coming into the classroom with a weapon,” said the school board member. On February 14, a mass shooting occurred at Marjory Stoneman Douglas High School in Parkland, Florida. Seventeen people were killed and 14 were taken to hospitals, making it one of the world’s deadliest school massacres. Such horror did not happen at Jordan Hill on February 21 when Narine was held up at gun point and robbed of her Nissan Frontier in front of staff and students. Her vehicle was found a few days later. But the crime was in focus during last week’s meeting. Discussion arose on hiring guards to man the pedestrian gate at Jordan Hill. A suggestion was made for parents to guard the gate but the board said it had to find out if this practice is legal. 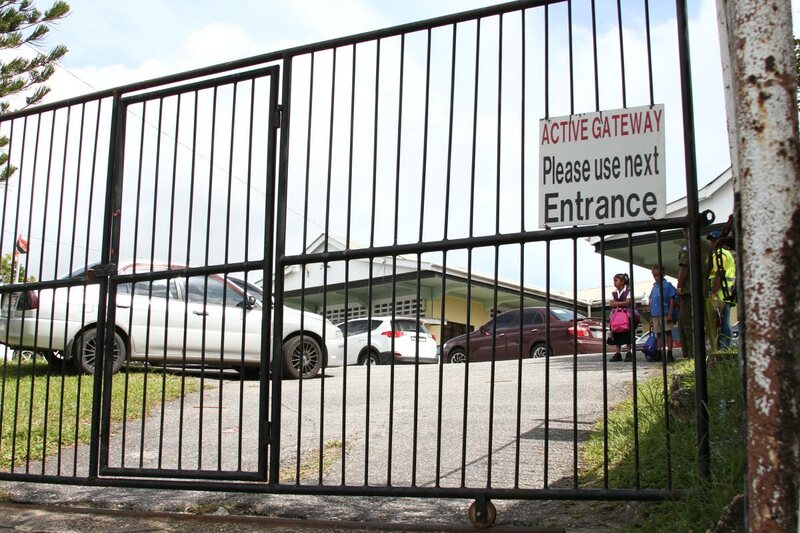 In the interim, the gate remains closed and the principal is in negotiations with Princes Town police and traffic wardens to manage the traffic flow which has worsened because of the use of one entry and exit at the school. Regarding, the Education Minister’s security protocol, the school board member, who did not want to be named, told Sunday Newsday the security needs of schools differed from one another which included the number of people to be protected to the location of schools. “All schools have been asked to develop a security protocol, based on their population, location and other demographics. Some schools have peculiar situations where you could have a security guard manning the front gate, but an intruder could scale the back fence,” the board member said. In order to hire more security guards and install security cameras, principals were advised at the meeting to seek help from parent teacher associations, past pupils and corporate sponsors. Principals complained some guards did not understand their roles and that security companies also did not manage them efficiently as guards were often asked to work double and triple shifts without relief. The principals added there were also times when school compounds were unmanned. The principals were told the role of security guards would be discussed with the manager of security services at the ministry. The board member told Sunday Newsday principals currently needed funds for basic items such as toilet paper so providing for security would be quite challenging. The board, the member said, raises money to manage schools and these funds are used to repair fences, air condition units and water pumps, but the board did not have access to funds from either the Presbyterian Synod or the ministry. Reply to "PRINCIPALS PUSH BACK"